THIS WEEK’S OTHER FEATURED BOOKS, “WE TAKE ME APART,” BY MOLLY GAUDRY AND “PIRATE SUMMER,” BY HL CARPENTER, CAN BE FOUND BY SCROLLING DOWN BELOW THIS POST, OR BY CLICKING THE AUTHORS’ NAMES ON OUR AUTHORS PAGE. SUMMARY: “What if everything you know turns out to be a lie? What if your parents kept a terrible secret that shatters your entire life on the day before your sixteenth birthday? What if you wake up trillions of miles from home on an alien planet that’s been torched by your own father? And what if the girl you love is involved in the darkest secret of all, one that forces you to confront her with the truth? “My name’s Docherty Harrison, and this is my story. Hey, I didn’t ask for all this. I just went out to get a pizza. I wasn’t ready to fight for my life. I’m just a kid from the most dysfunctional family in the universe. THE BACK STORY: “I’ve spent twenty years writing all kinds of books, from science fiction to fantasy to military thrillers to media tie-in novels. I longed to return to my roots as a science fiction writer and work on a coming of age tale. WHY SOMEONE WOULD WANT TO READ IT: Those who are young or young at heart will, I hope, find the characters and situations to be dramatic, action-packed, fun, and inventive. I’ve put a lot of time and research into creating unusual and exciting worlds, creatures, and character abilities within the series. There’s also a really timely and important environmental theme that runs throughout all of the books. NOTE: You can read all of Peter’s reviews on his Amazon page. AUTHOR PROFILE: Peter Telep is the author of more than forty novels. His collaboration with Tom Clancy, Against All Enemies, debuted at #1 on the New York Times Bestsellers List. Additionally, he has written many bestselling novels based on Tom Clancy’s Ghost Recon, Endwar, and Splinter Cell video game series. He is a produced film and television writer and has worked alongside professionals throughout the video game industry. 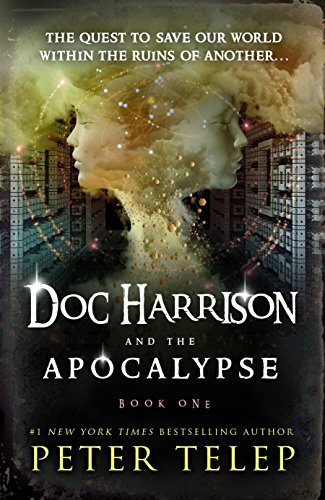 The Doc Harrison series marks his return to fantasy and science fiction where he began his career.